CYCLIST Danny MacAskill’s has raked in more than £1 million from his daredevil stunts, new figures have revealed. The star street-bike rider’s income is reportedly soaring as he travels the world performing for adverts and promotional videos. Latest accounts for the 31-year-old’s main company DMAC 24 show it had total assets of £1,087,060 - nearly double the figure of £587,356 from last year. That included nearly £800,000 held in a bank account and more than £250,000 owed to it by debtors. The company owed creditors £309,000 and declared retained profits for last year of more than £390,000. MacAskill, who rose to stardom by posting videos on the internet while working at Macdonald Cycles in Edinburgh, also has a second firm Drop and Roll Worldwide, which handles income from his touring shows. Danny MacAskill performing tricks in West Princes Street Garden, Edinburgh. Its accounts show it has assets worth more than £165,000. The cyclist, from the Isle of Skye, has seen his earnings soar in recent years but the swollen coffers come despite him regularly rejecting big offers. He has previously said: “I’m not motivated by money or fame. The only thing that really excites me is doing stuff with my friends. “I’ve never really been a money-driven person. 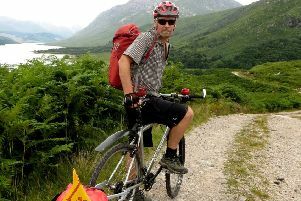 MacAskill is famous for his nail-biting tricks including leaping onto a single train track, turning a hay bale into a giant unicycle, riding over a cottage, and disappearing into a 6ft puddle. In October 2014, he released a film titled The Ridge, shot on his home island of Skye, which shows the superstar cycling along the steep and rocky Cuillin Ridge. In its first five days, the video was viewed a staggering 10 million times on YouTube. It has now had more than 53 million views. MacAskill shot to fame on the back of his Inspired Bicycles film shot on the streets of Edinburgh which was a web smash hit in 2009. Macdonald Cycles subsequently became an unlikely tourist haunt for MacAskill’s legion of fans. It closed in 2013 after almost 80 years in business despite an unprecedented surge in cycling interest. MacAskill set up DMAC that year —to channel his earnings with mum Anne as co-director and dad Peter as company secretary and gave up his job as a mechanic to begin riding and filming full-time. In 2012, he launched plans for a range of cycling merchandise called Balance and he also has a lucrative sponsorship deal with Red Bull. Last year he released his autobiography, At The Edge, which charts his rise to fame. He recently said the amount of time he can continue to ride may be limited due to a number of injuries he has suffered carrying out his stunts.